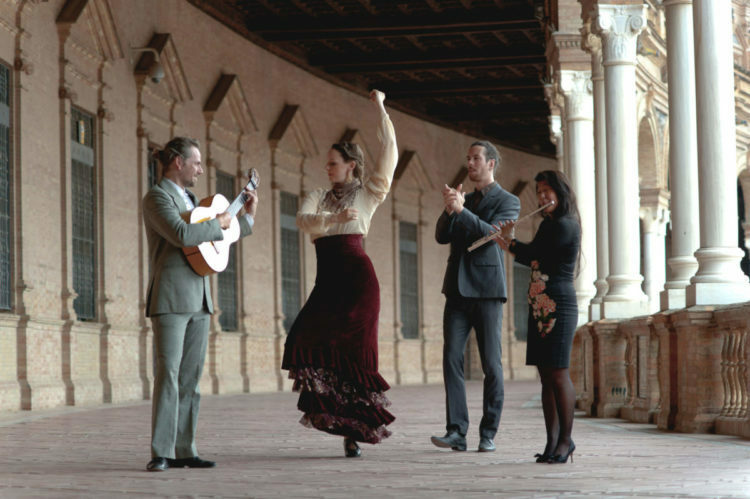 With youthful zeal and contemporary charm, Fin de Fiesta brings the energy and excitement of the open jam session at the end of a flamenco show to their entire performance. The troupe, based in Seville, features both Canadian and international artists in a collaborative partnership. Their show was a passionate display of both music and dance that was bursting with energy. Artistic Director and soloist Lia Grainger began the show dancing with her triangular floral-patterned shawl, a traditional flamenco prop that was vigorously manipulated with grace and ease as she spun. She is a very focused dancer — every furrowed brow and flick of the finger was infused with determination. In another solo, Grainger returned to the stage in a black pant suit, a very contemporary look for flamenco. In her third solo she wore a fiery red dress with tiered flounces and a tasseled triangle scarf around her neck. Her fast footwork, and sharply coordinated movements incorporated her entire body while remaining more cheerful than fiery. Deborah Dawson, another featured dancer, performed her contrasting style in a fuller dress of blue and gold hues adorned with tassels. Her style was more aggressive and sassy, with knowing looks to the audience. In her second solo she wore a black dress with striking red shoes and incorporated body percussion, adding to the musicians seated at the back of the stage. Flautist Lara Wong played her beautiful melodies along with remarkable guitarist Dennis Duffin, and percussionist Davide Sampaolo. Singer Alejandro Mendia rounded out their full harmony with his powerful, stirring voice. Always encouraging each other with hand claps and shouts of “olé!”, the troupe was having so much fun on stage, and this translated into a great experience for the audience. They did, in fact, have their own “fin de fiesta” on stage at the end of the show, taking turns improvising — even the musicians took a turn showing off their flamenco moves. They finished off a memorable evening, and the final show of their national tour, with a celebratory ode to this vibrant art form.